Doll House Accessories help your mini world come together. September 2011. In the miniature world these days there are many types of materials used to accessorize your creation. Some materials are: cloth, clay, wood, metal, dough, glass, pewter or porcelain to name a few. In the book Creative Dough Crafts we find a quaint but amazing miniature. Brigitte Casagranda isn't solely creating for her tiny world however. She is simply illustrating how we can use dough in any particular fashion we want. Both in large and small patterns. That said however she does have a dollshouse featured in her book. Which as you would imagine is a real draw for a dollshouse lover such as myself. The projects she outlines in her volume are worth getting into also. Though as we look inside her book we find that she is using, not a store bought version of modeling clay, but her own homemade dough substance. As we miniaturists look at these types of books the challenge for us would be to miniaturize all we see inside the pages. And that goes for any larger pattern book we may possess as well. It can be done and by you. Start recalculating each feature and make your design in scale for your special structure in whatever size you happen to possess. It would be fun and a rich labor of love for doll house accessories. Mix the dry ingredients together. Then form a well in the center. Add enough water to make a dough that's neither too wet or dry but just right. Keep the room temperature about 70 F (21 C) for working your dough. Any further info needed for this dough? What I suggest? Of course... Get the book. Making Miniature Oriental Rugs & Carpets is a book about just what it states. However the rugs and carpets are absolutely life-like, realistic gems. If you desire something for your mini that looks real in this department then acquire this book and get started. 'Tis to drool over really. Soft Furnishings for Dollhouses makes use of fabrics of all sizes and shapes. This book has 215 Enchanting NoSew Designs and Patterns for you to stop dreaming over and get started at the finishing touches to your collection with. I know it does take time to finish all that we would like to, right? However no time better than the present, as they say. The last five month issues look into topics related to furniture creation. Check those issues out here. A great miniature scale calculator can be found here. Along with the above mentioned tool you can also try using this leading architectural software. Chief Architect Home Designer Architectural. As well find more info concerning Home Designer here. It is a software program worth your time when designing your own plans. For this month's miniature project I thought I would do a mini form of something in front of me. I am going to take this item out of my doll house accessories wishlist and make a playscale cookie jar. Join in the fun and create your own mini item along with me. For your Information: Hovering your mouse over any picture below will display the details for that item. Clicking on the picture will take you to Amazon. A list of all needed materials for this craft can be found below this widget. The widget shows our suggestions for materials needed. Pick your desired item to miniaturize. Are there things around you that you could easily see as doll house accessories? Don't go overboard with this. And don't especially if you have never attempted a project like this shoot for the moon sort of. You want to enjoy your journey not end up in a depressed slump because your doll house accessories project was too big for your level of accomplishment. So keep it simple, fun and enjoyable. You'll thank me for it later. And my chosen item to miniaturize? What else the cookie jar right on my desk. Like I said make it easy. But as well do your best work. Choose your favorite scale: I thought I would progress in my usual manner and stick with the scale I love, which is the playscale size. Decide on the material you will use to create your masterpiece with. My choice will have to be Fimo Clay. It bakes well and gives realistic looks to what you want to accomplish. However one could also use the recipe above to shape this cookie jar. Calculate your measurements using the scale calculator found here. With tools like this our work is made much simpler for sure. I left pen and paper calculations long ago and I love an easier way do you? Using a clay machine begin softening the clay to work with. The clay machine is inexpensive but awesome when working with Fimo. 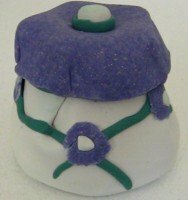 Even old Fimo that you may think is passed it's usefulness can come back to life with a clay machine. I seriously thought at one time my clay was good for nothing but the garbage but as it turned out it was perfectly usable. Start shaping your object using your fingers and a rolling pin. Create little embellishments to decorate with in this step. Bake each item in your kitchen oven. Glue all pieces in place with a proper for the item glue. And you're finished your addition to your miniature doll house accessories. Make sure to put a piece of you into your creation. Take detailed notes of what and how you did it and put into your file of created miniature goodies you have started. View or Buy doll house accessories - Miniature Cookie Jars. Making food for your dollshouse is an exciting art form. If you have ever wondered about the "how-tos" of mini food creation this book can teach you that for sure. Simply reading all the 5 Star reviews for this book, you will get the picture that the folks that bought Angie's book loved it. "Food tends to be a neglected area in the miniature world, probably because it is usually unrealistic. Miniatures artist Scarr makes wonderfully realistic food from polymer clay. Her book is full of step-by-step projects for bakery goods, meats, fruits, and vegetables, all photographed in great detail. These pieces are intended for a miniature market stall project with awning and crates and can also be used in dollhouse kitchens and pantries." View Making Miniature Food and Market Stalls here. 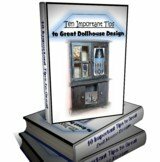 Free EBook Offer 10 Important Tips to Great Dollshouse Design! Get our new free ebook today. Learn how to start your next project with the enthusiasm it and you deserve. Woodworking Techniques for your Favorite Designs Woodworking Techniques do not have to be complicated. All that is required is that you learn a new skill. And what an awesome skill it is. To design and create your very own mini mansion or doll house accessories. What an accomplishment to display! Best Miniature Plan you can Create. Your Miniature Plan. Design your best work ever because you know and understand these three keys to your success. Check out this page for your share of encouragement today. Work-at-home-moms! You know you can do it today! Work-at-home-moms are a breed unto their own. 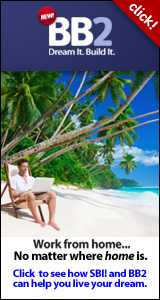 Do you have it in you to work from your home? Find out if you do. Take this course. Start today! For more details about our site check out Our Blog here.